Rivers and canals in Bangladesh are becoming increasingly polluted from industrial wastewater dumped by factories, many of them in the textile industry, The New York Times has reported. Leather tanneries are also a significant source of toxic pollutants to the air and water. The water pollution threatens food production and is raising both environmental and human health concerns. Human Rights Watch issued a report late last year on the human health effects of unchecked pollution from the leather industry. 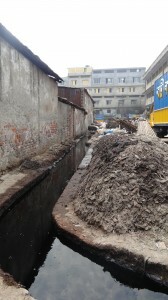 The report, Toxic Tanneries, documents an occupational health and safety crisis among tannery workers, both men and women, including skin diseases and respiratory illnesses caused by exposure to tanning chemicals, and limb amputations caused by accidents in dangerous tannery machinery. Residents of the area where the tanneries are located are also seriously affected. The government has consistently failed to enforce labor and environmental laws in Hazaribagh, a suburb of Dhaka, and has ignored High Court orders to clean up or move the tanneries.